The Smithsonian American Art Museum and the Smithsonian’s Hirshhorn Museum and Sculpture Garden have jointly acquired Arthur Jafa’s (b. 1960) iconic video “Love is the Message, The Message is Death” (2016). 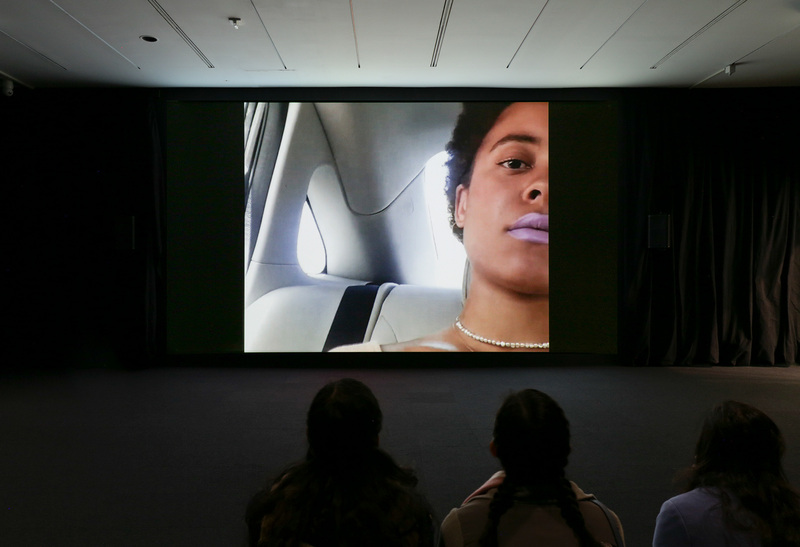 Considered a breakout work when it debuted in 2016, the single-channel video signaled a shift in approach to contemporary American discourse on race and politics through the use of CCTV, documentaries, YouTube and social media footage alongside Jafa’s own personal home movies. This is the first joint acquisition between the Smithsonian’s two museums most active in collecting contemporary art. Both museums have a long-standing commitment to the acquisition and presentation of contemporary moving-image works. “Love is the Message, The Message is Death” was recently on view as a highlight of the Hirshhorn’s exhibition “The Message: New Media Works,” which closed in September. “Love is the Message, The Message is Death” is a moving montage of original and appropriated footage, exploring the mix of joy and pain, transcendence and tragedy that characterize the African American experience at this historical moment. Set to Kanye West’s gospel-inflected song “Ultralight Beam,” the seven-and-a-half-minute piece swells with spiritually uplifting but candid lyrics; the music occasionally recedes allowing poignant snippets of dialogue to come to the fore. This tightly controlled editing echoes the intricate rhythmic structures of jazz, soul and hip-hop, while the source selection perfectly captures the range of mediation through which contemporary viewers experience and understand race in America. Getty-watermarked footage nods to the commercial afterlife of civil rights leaders and riots; silent-era film and sensationalized news clips link constructions of blackness across a century of moving images; and camera-phone-recorded YouTube-distributed videos highlight how personal moments can now become shockingly public, whether through choice or necessity. Funding for the acquisition is provided by the Joseph H. Hirshhorn Bequest Fund; Nion T. McEvoy, chair of the Smithsonian American Art Museum’s commission (2016–2018); and gifts made in McEvoy’s honor by his fellow commissioners. For 20 years, Jafa has straddled the worlds of filmmaking and fine art. Since serving as director of photography on Julie Dash’s groundbreaking Daughters of the Dust in 1991, Jafa has worked as a cinematographer on major films, such as John Akomfrah’s Seven Songs for Malcolm X (1993), Spike Lee’s Crooklyn (1994) and Nefertite Nguvu’s In the Morning (2014), as well as on music videos for artists such as Jay-Z and Solange. He started showing work in art contexts in 1999, and was included the Whitney Museum of American Art’s Biennial in 2000. A recent solo exhibition entitled “A Series of Utterly Improbably, Yet Extraordinary Renditions” debuted at the Serpentine Gallery in London in 2017 and is currently touring in Europe. A solo exhibition featuring new, commissioned work opens at the Berkeley Art Museum and Pacific Film Archive Dec. 12. Jafa’s work is in private and public collections worldwide, including The Metropolitan Museum of Art, the Museum of Modern Art, The Studio Museum in Harlem, the High Museum in Atlanta, the Dallas Museum of Art, the Museum of Contemporary Art in Chicago and the Stedelijk Museum in Amsterdam. Jafa was born in Tupelo, Mississippi, studied at Howard University in Washington, D.C., and currently resides in Los Angeles. He is represented by Gavin Brown’s enterprise. The Hirshhorn Museum and Sculpture Garden is the national museum of modern and contemporary art and a leading voice for 21st-century art and culture. Part of the Smithsonian, the Hirshhorn is located prominently on the National Mall in Washington, D.C. With nearly 12,000 paintings, sculptures, photographs, mixed-media installations, works on paper and new-media works, its holdings encompass one of the most important collections of postwar American and European art in the world. The Hirshhorn presents diverse exhibitions and offers an array of public programs on the art of our time—free to all, 364 days a year (closed Dec. 25). For more information, visit hirshhorn.si.edu. The Smithsonian American Art Museum, the nation’s ﬁrst collection of American art, is the home to one of the largest and most inclusive collections of American art in the world. These artworks reveal America’s diverse artistic and cultural history from the colonial period to today. The museum has been a leader in identifying and presenting signiﬁcant aspects of American visual culture, including photography, modern folk and self-taught art, African American art, Latino art and video games. The museum has the largest collection of New Deal art and exceptional collections of sculpture, contemporary craft, American impressionist paintings and masterpieces from the Gilded Age. Its National Historic Landmark building is located at Eighth and F streets N.W. and is open daily (except Dec. 25) 11:30 a.m. to 7 p.m. Admission is free. Follow the museum on Facebook, Instagram, Twitter and YouTube. Museum information (recorded): (202) 633-7970. Smithsonian information: (202) 633-1000. Website: americanart.si.edu.